The original prison at Newgate was built in 1188 but was rebuilt in 1770. After being badly damaged during the Gordon Riots in 1780, George Dance was commissioned to design a new prison at Newgate. Completed in 1782 Newgate Prison was divided into two sections. There was a Common area for poor prisoners and a State area for those who could afford more comfortable accommodation. These sections on the prison were further divided between debtors and felons. The women's section usually contained about 300 women and children. In the first half of the 19th century Newgate Prison was London's chief prison and was where prisoners were held before execution. In 1783 the gallows were moved from Tyburn to Newgate. Every Monday morning large crowds would assemble outside Newgate Prison to watch the men and women executed. A seat at one of the windows overlooking the gallows could cost up to £10. Public executions were abolished in 1868 and until 1901 prisoners were hanged inside Newgate. 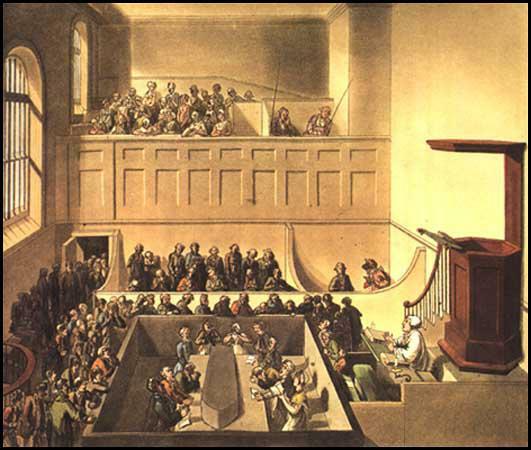 The picture below shows condemned prisoners at Newgate chapel on the Sunday before their execution. Newgate obtained its name from being erected several hundred years after four original gates of the city and was the common goal for felons taken in the city of London. On the Sunday the condemned sermon is preached; during which a coffin is placed on a table within an enclosure; called the dock; and around the coffin are prisoners condemned to die. (2) Elizabeth Fry, letter to three of her children, John (9), William (7) and her daughter Richenda (5), written on 13th February, 1813. I have lately been twice to Newgate to see after the poor prisoners who had poor little infants without clothing, or with very little and I think if you saw how small a piece of bread they are each allowed a day you would be very sorry. I could not help thinking, when there, what sorrow and trouble those who do wrong, and they have not the satisfaction and comfort of feeling among all their trials, that they have endeavoured to do their duty. I hope, if you should live to grow up, you will endeavour to be very useful and not spend all your time in pleasing yourself.